“Selection of the right architectural elements for lighting design is as critical as the design itself” says Sushant Surve, founder of Brainwave Designs, Mumbai. His creativity and visualisation was realised in the project they recently completed in Ahmedabad – Parshwanath Business Park where he selected the fins of the building as the architectural element and created a masterpiece lighting design and installation. The concept he perceived was to use the fins of the building facade as the surface to project various colours and animations bringing the whole facade to life. The design & concept was realised using the SGM LED luminaries, a Danish manufacturer, using their professional outdoor luminaries – G Spots and Q-7s. The major challenge was to wash the complete 2500 sq m of facade from a distance of only 8m. With the fins all over the facade, the selection of angles was critical as the spill of light to inside the building had to be controlled. 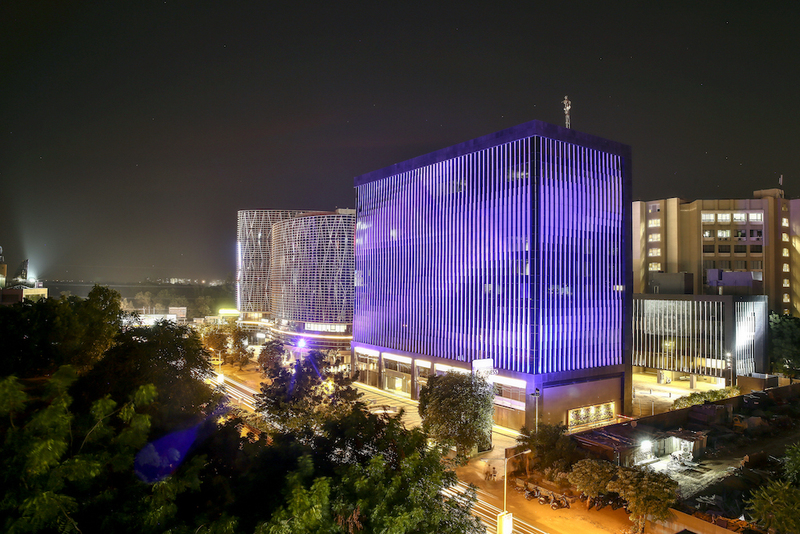 With the support from LightLabs, Mumbai for installation and DMX programming, Brainwave Designs was able to achieve the desired effect on the facade making it one of the landmark installations in Ahmedabad. The structure has become a landmark in itself and the fluid effect of dynamic lighting can be clearly seen from far off. The structure stands out quiet differently from the other buildings in the vicinity and has created a statement of an outstanding structure balanced with great lighting. Both the client as well as the lighting designers are satisfied that the entire design intent was realised flawlessly. “As a lighting designer you can only create magic and think out of box if the client is 100% with you. In this case, although we came up with an innovative concept, it would not have been possible without the clients support,” concludes Sushant.